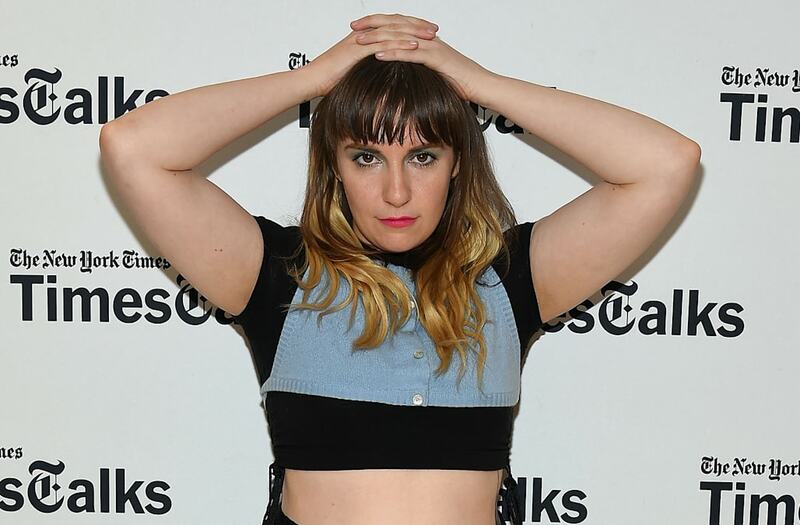 Lena Dunham's fierce fashion statement on Wednesday night got the seal of approval from her pal and Girls co-star, Jemima Kirke. Dunham's new blonde ombre hairstyle went right along with her edgy outfit, which included a blue and black crop top and a matching floor-length skirt and high heels. As for her makeup, she rocked blue eye shadow and hot pink lipstick. The 30-year-old actress-writer stepped out in the style for the TimesTalks: A Final Farewell to the Cast of HBO's Girlsin New York City, and was joined by co-stars Kirke, Allison Williams and Zosia Mamet. "Thank you New York Times @timestalks and the genius @jennydeluxe for a chance to reflect, revolt and rejoice," Dunham captioned a photo of herself and the Girls cast. "BTW, Jemima told me I looked cool for the first time in like 17 years. Win!" During their conversation with moderator Jenna Wortham, Mamet insisted that the cast is "boringly well-behaved," though Dunham did admit to having a romantic tryst while filming the first season of Girls. "I did make out with a day player actor on our show in the first season," she revealed. "Before we understood the full boundaries of professionalism." Dunham further recalled, "I was like, 'You've been on set for eight hours. You seem interested in me and my power. I would love to go to the 11th Street Bar with you.'" The Golden Globe winner said she soon realized that her meeting up with the guest actor outside of work was not a great idea. "Then I kind of got there, I was like, 'Oh wow, this person doesn't even think I'm cute,'" she said. "He's just like, 'She runs a TV show and I'm actor.' I was like, 'This is a nightmare. I've inadvertently become the grossest male producer.'" After that experience, Dunham decided that she wanted to "commit to the same person for the rest of my life," and soon after met her longtime boyfriend, Jack Antonoff. The 10-episode final season of Girls premieres Sunday, Feb. 12, at 10 p.m. ET on HBO.